Photo by John Manoogian III on Flickr. I find myself writing the same email over and over again. 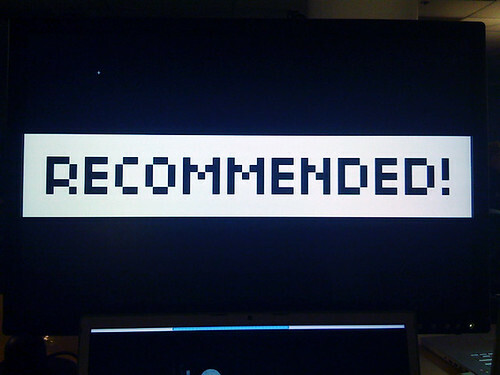 It’s the email with a bullet point list of blogs I recommend to read and video’s I recommend to watch to get a sense of the world of museums, technology and media. Here’s some of that list, stuff well worth the hours it will take you to find your way through it. Video: Koven J. Smith’s epic 5-minute Ignite talk about the reason we should stop building websites has been seen by everybody, yet never hurts being repeated. Video: Nora and Francesca of the Guggenheim organised one of the best projects the (museum) world has seen in recent years: YouTube Play. See them talk about it at MuseumNext. Video: Another MuseumNext presentation, and this time one that changed my way of thinking considerably. Rich Mintz talks about successful campaigns and other useful stuff. Video: Michael Edson is one of culture’s rock stars, if you ask me. His interview in This Week in Libraries (great show) is a rollercoaster ride of disruptive thinking. Video: Mia Ridge does amazing work on the gaming and more tech-savvy side of museums. This presentation she gave a couple of months back had me jotting down countless ideas. Video: You can’t talk the future without talking mobile and nobody does better so than Nancy Proctor. Recruit the world this presentation is called, and it sticks. Blog: Thinking about exhibits by Ed Rodley rocks (as coolest-museum-director-in-the-world Nina Simon noted earlier), especially his series about gaming the museum. Blog: Rising star Susan Cairns writes a highly intellectual blog about museums and technology, which includes a nice series about how people ended up in the sector. Fun. Blog: The Uncataloged Museum by Linda Norris doesn’t necessarily deal with technology, but it does deal with everything else you need to think about. Always thought-provoking. The obligatory reading (but don’t we all devour this already? ): Fresh+new(er), Museum 2.0 and Jim’s various blogs. Not enough cats? Too many nerds? What did I miss? What inspires you? Please add your favourite links to the comments below, so from now on I can limit myself to sending one link when people ask for inspiration:-) Thanks!